Clusters of softly glistening grapes, shimmering pears, or radiant apples in Carmela Kolman’s new paintings, each isolated against fields of muted hues, present minimalist evocations of the traditional genre she excels at, still life. 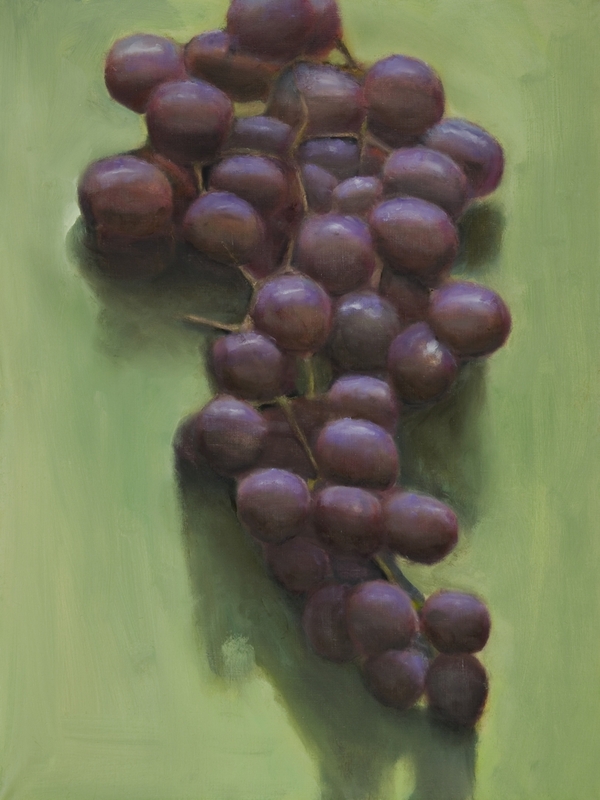 For her first solo show at the gallery, the Painting Center is pleased to present a focus on Kolman’s signature subject, fruit. The provocative juxtapositions of sensuality and restraint speak to conflicted desires in a period of political flux and economic instabilities. A well-respected New York painter (RISD BFA; Yale MFA), Kolman’s previous exhibitions at the Center have been a two-person show and a thematic exhibition with Zeuxis, the artists’ group devoted to contemporary still life painting with whom she regularly exhibits throughout the United States. Kolman’s compositions are distinguished by a spirit of thoughtful selection rather than the traditional tabletop heterogeneity, displaying the fine attention to placement, adjacent lines, and consistency of objects of Giorgio Morandi’s judicious arrangements of vessels. Kolman further subverts the traditional frontal perspective onto tabletop arrangements – the cornerstone of traditional still life – by viewing her objects from immediately above. The orbs of fruit are often seen against ambiguous grounds that are neither table nor wall – in effect, presenting a modernist flattening of space against which the fruit “pops.” Sometimes, these grounds are in a subtly greyed or toned hue, both spatially and emotionally recessive. These compositions’ moods suggest vivaciousness against a ground of withdrawal.